Nemours Jn Baptiste would've been 100 years old if he was alive today in 2018. 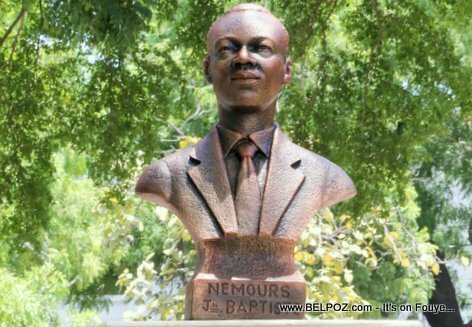 To commemorate the 100 year aniversary of the maestro and founder of Konpa Direk, a new bust of Nemours Jn Baptiste was erected at Place Saint-Anne in Port-au-Prince. This event took place on July 26 2018 which marks 63 years since Maestro Nemours Jn Baptiste formed the first ever Compas Direct music group "l'Ensemble Aux Calebasses," which marked the birth of Compas Direct. 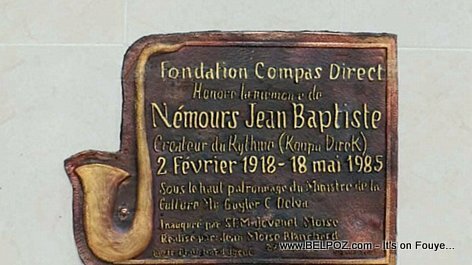 "Fondation Compas direct honnore la memoire de Nemours Jean-Baptiste, createur du rythme Konpa Direk, 2 Fevrier 1918 - 18 mai 1985, su le haut patronnage du Ministre de la Culture Guyler C. Delva, inauguré pas S.E.M Jovenel Moise"
His son, Nemours Jean-Baptiste Junior, the children of the Nemours Jean-Baptiste school in Martissant and many fans, Guyler C. Delva, Minister of Culture and Port-au-Prince Depute Printemps Bélizaire were some of the people present at the unveiling ceremony. Se fondasyon Nemours Jean Baptiste ki mete stati sa ak sipò Minis kilti a Guyler C. Delva.